I love putting together a coffee table vignette. that open, flat surface that calls out to me. as a gift a few years ago. I think they are so pretty! I had to buy those skinny reindeer at TJ Maxx this year. I couldn't resist their long, skinny legs. Time is moving right along. It's hard to believe there's only 12 days left 'til Christmas! 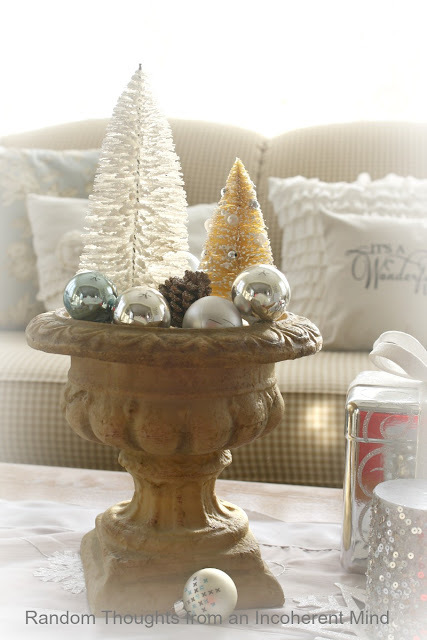 Love the urn with bottle brush trees and the silver gifts. Great vignette, Gina. Gina, the display in the urn is amazing!!! Pinning it for future inspiration! Looks great Gina! Theres something so calming about the silver and white. love the urn as well! Beautiful Gina! The 4th picture looks just like a magazine photo. Even the sun wanted to come over and enjoy the whimsy you created, Gina. A non decor friend told me the other day "oh, you chose the safe theme. there's not much wrong you can do with white, silver and gold for the holidays"
Beg to differ. You can do wrong and you can do wonderfully right like in this case. Amazing Job, Dear Gina!!! I love that urn especially with the brush trees!! Your sun came our way! Oh Gina, that is so pretty! I LOVE those reindeer, too!! Very pretty Gina! 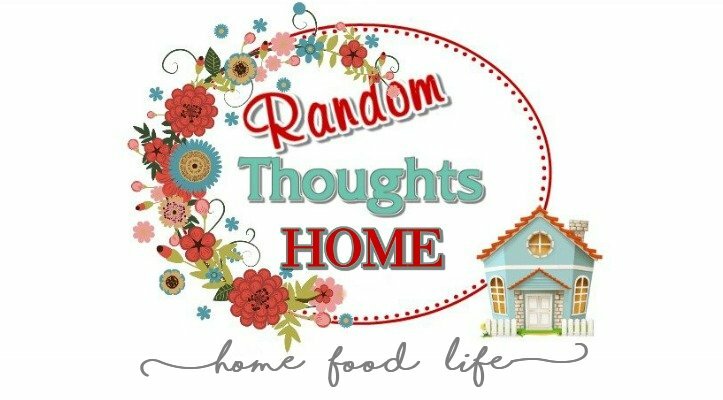 I always love your vignettes! You sure can make a gorgeous table scape. So pretty, original and personal for you. Isn't that part of what decorating is about, your personal take on using things you love. Your take on it all is splendid. I'm sure inspired. Your pillow in background is incredible also, Wonderful life pillow? Did you make that one yourself? If so please tell us how you did it, maybe a transfer to use. If you didn't make it where did you get it? Love it for it's being different, never saw one before. 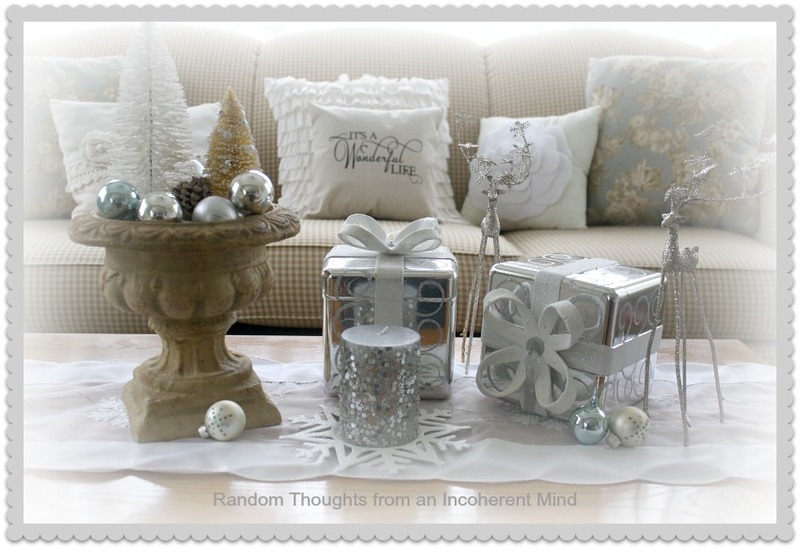 I love your coffee table vignette, those silver gifts are so pretty, love the urn too! 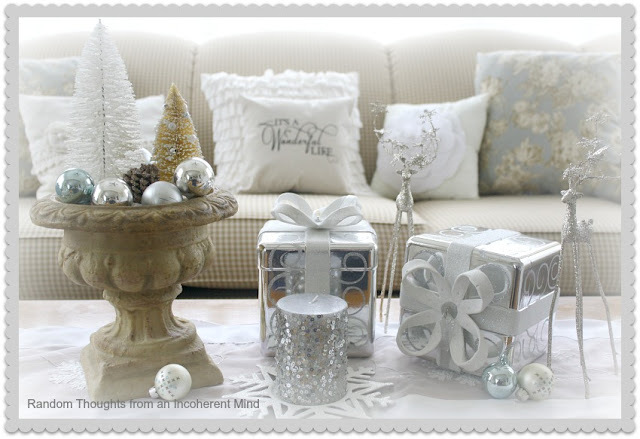 Oh I love your table and the silver presents are so pretty! Gorgeous tablescape, Gina. I love those little deer, too! 12 days?!?! I'd better get moving. You know that is so pretty it makes me want to wrap some gifts as table decorations. But I can't get the real wrapping done so don't hold your breath. I love your coffee table vignette. Long skinny legs? What are those? Yes, the sun finally made a reappearance here, too. I wanted to go out and bask in it yesterday morning and then realized it was 24 degrees at the time. Not really good for basking. Gina, your table looks fabulous! No, you are not crazy. I have been eying mine all week. LOL You did a beautiful job. Love the silver present. So original! I love the silver, and white together.... nice!! Have a wonderful weekend, and I hope you continue to enjoy this wonderful Christmas season. 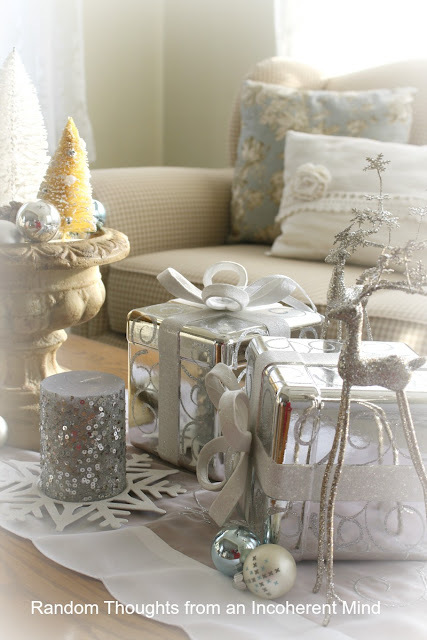 My coffee table is my most favorite surface to decorate...So I know what you mean :-) love those cute little reindeer. Everything looks beautiful....Wishing you a very merry day my friend. I love, love your coffee table. The bottle brushes are so cute and they look great in the urn. I am also loving the "It's A Wonderful Life" pillow on the sofa. That is my family's favorite Christmas movie. Such cute tables for both days! The reindeer are neat and your Eld ia way too cute. 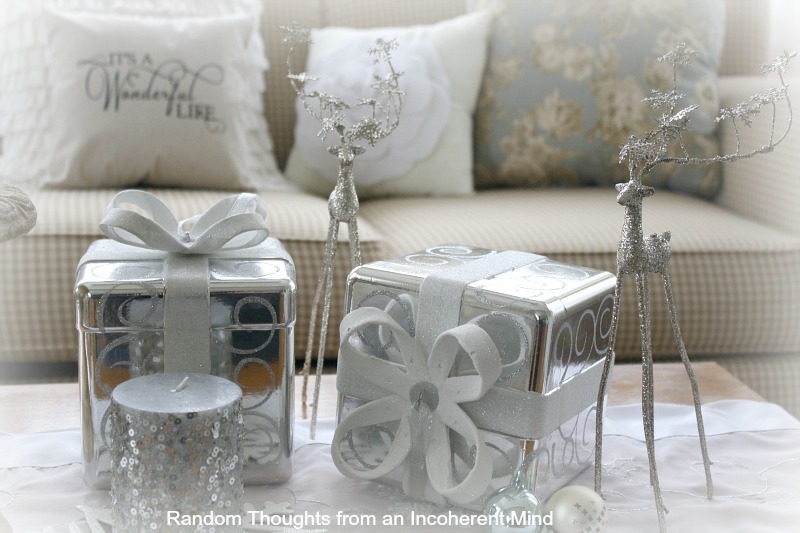 I love silver decor at Christmas. Such a beautiful display Gina. Enjoy and get that baking done. My daughter and I baked for a week to get it done. I'm so impressed that you have a coffee table that's not full of clutter! We quit using one because we could never use it. Yours is inspiring. thank you for sharing.